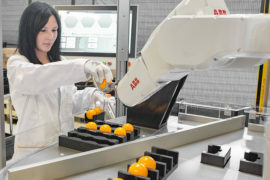 Mitsubishi Electric has extended its RH range of MELFA SCARA robots with the launch of the new F Series, setting new benchmark standards for speed, flexibility, ease of integration and simplicity of programming. Combining a wide area of coverage with the industry’s fastest cycle times, the F Series provides a cost-effective means to boost productivity on critical production lines. 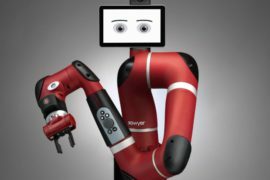 In addition, with the inclusion of a low-cost entry-level model, Mitsubishi Electric has made it possible for many users to reap the benefits of robotic lifting, positioning and assembling, perhaps for the first time. The F Series includes two base models with various options: the RH-3FH provides a 3kg payload, while the RH-6FH provides a 6kg maximum payload. With a 12 inch test cycle time of just 0.29 seconds, the new robots offer the fastest motion in their class. 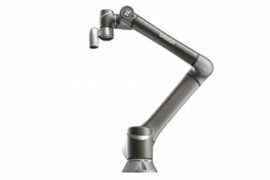 For increased flexibility in operation, Mitsubishi Electric has increased the working range for the J1 axis on these robots, allowing a reachable area from ±127° to ±170° to be achieved with just one arm configuration. For use in challenging environments, the F Series provides increased protection as standard for the spindle throughout the housing, and in the most demanding applications the protection level can easily and cost-effectively increased to IP65. 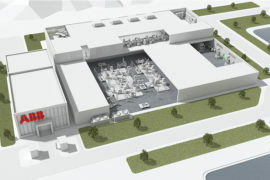 In addition, all wiring is routed internally through the spindle, further increasing applicability in demanding environments as well as increasing long term reliability and reducing maintenance requirements by eliminating the possibility of the cables tangling. 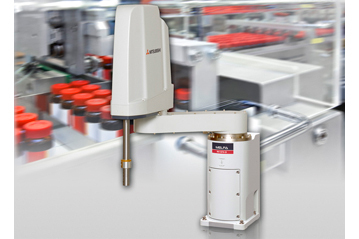 Designed for simple integration, the new F Series robots include Ethernet, USB, tracking functions, camera interface, Hand I/O and additional-axis connections as standard. 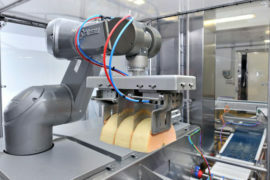 The robot comes complete with standalone controller unit as standard, and is also available as a fully integrated package where the robot controller is embedded in an iQ Platform module for direct integration with Mitsubishi PLCs and PACs. 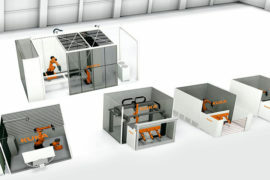 For production lines requiring the use of a number of robots, the IQ Platform provides ‘cooperating robots’ as a standard function, as well as an ‘anti collision’ function to automatically prevent collisions between robots working close together. For quick and easy commissioning, offline programming is simple via Mitsubishi’s RT ToolBox2 PC based software for programming, monitoring and debugging, or through MELFA Works 3D robot and working cell programming and simulation software which helps the user to check the complete program for errors or collisions before it is run in the real application. Furthermore, the RT ToolBox2 software is included within Mitsubishi Electric’s iQ Works software, which additionally provides a complete integrated engineering software suite for the company’s whole range of automation platforms – PLCs, servo systems, motion controllers, variable speed drives, HMIs, PC-based controllers and CNC systems – enabling complete automation installations to be programmed from within a single software environment.